FOXBORO — The Patriots have signed former wrestlers and lacrosse players. So when New England selected Ohio State safety Nate Ebner in the sixth round (197th overall) of the NFL draft on Saturday, it should come as no surprise. After all, before Ebner started playing football, he was considered one of the best teenage rugby players in America. Of course, there are some connections between rugby and football. A few, anyway. “It compares in the fact that we hit each other and there’s a lot of running and some big dudes,” Ebner said in a conference call with reporters on Saturday shortly after the Patriots picked him. “I don’t know that it compares a lot. I’d say just the speed of the game and the tackling are similar. Ebner joined the Buckeyes as a walk-on in 2009 after an impressive career as a rugby player — playing on the under-19 and under-20 U.S. national rugby teams, he was named MVP of those teams in the 2007 and 2008 world rugby tournaments, according to the Columbus Dispatch. With the Buckeyes, he played sparingly on defense, but eventually landed a scholarship and became a key component of Ohio State’s special teams unit. He had 11 tackles as a senior, as well as a sack. He popped up on radar screens with an impressive Pro Day, where he ran a 4.55 40-yard dash, finished with 23 reps on the bench press, showed off a 39-inch vertical and impressed everyone with a 6.59 3-cone time. “Nate is a guy that is a big, fast safety that has been very productive in the kicking game,” Patriots coach Bill Belichick said. “[He’s a] relatively inexperienced player that we think has a lot of good football in front of him. It’s clear that Ebner the football player has a gonzo side that was sparked by Ebner the rugby player. That’s evident when he talks about his favorite part of special teams. Ebner said that his first contact with the Patriots was with defensive assistant coach Brian Flores, who works with special teams coach Scott O’Brien. After some contact with the Patriots both before and after his Pro Day, he also got some sense from former Patriots linebacker and current Ohio State assistant Mike Vrabel that his skills as a special teamer could land him a spot in the NFL. COLUMBUS, Ohio -- Former Ohio State linebacker Andrew Sweat stopped being a Pittsburgh Steelers fan shortly after the NFL Draft ended Saturday. The native of western Pennsylvania signed with the Browns, as did former Ohio State right tackle J.B. Shugarts. "They gave me an opportunity," Sweat told The Plain Dealer. "They're my new favorite team." Those signings came after four Buckeyes were taken in the draft, with running back Dan Herron (No. 191 to Cincinnati) and special teams ace Nate Ebner (No. 197 to New England) going in Saturday's sixth round. Offensive tackle Mike Adams (second round to Pittsburgh) and receiver DeVier Posey (third round to Houston) were drafted Friday. Center Mike Brewster, projected as a mid-round pick by most analysts, wasn't drafted but signed a free agent deal with the Jacksonville Jaguars. Sweat, who can play any linebacker position, has been accepted to several law schools but is taking another shot at football, hoping to show the kind of player he is after his senior season was sidetracked by a concussion and an elbow injury. "I really think that I haven't shown that," Sweat said. "I was hurt my whole senior year. We'll see. I'll let my actions speak for themselves and go out and play." Herron went to Cincinnati as the first Buckeye drafted by the Bengals since 1994, when Cincinnati made defensive tackle Dan Wilkinson the No. 1 pick. He should have a chance to serve as a running back complement to free agent signee BenJarvus Green-Ellis. "He has a chance to make the team by being a runner, playing on special teams, a receiver, and so forth," head coach Marvin Lewis said at a post-draft news conference. Both Herron and Ebner were helped by strong showings at Ohio State's pro day, with Ebner impressing the Patriots with his special teams capabilities after not playing high school football and walking on at OSU. Patriots head coach Bill Belichick told New England reporters that his connection to his former player, and OSU assistant, Mike Vrabel helped with Ebner. "Nate is a guy who's a big, fast safety ... very productive in the kicking game," Belichick told Patriots Football Weekly. "Relatively inexperienced player. We think he has a lot of good football in front of him." Ebner's selection was something of a surprise, but he'd drawn serious interest and told The Plain Dealer this week he knew there was a chance he'd be picked. The biggest surprise of the draft for Ohio State was that Brewster wasn't selected. An Orlando native, Brewster left Florida, started at center for Ohio State for four seasons, was projected by most analysts as a mid-round pick and then never heard his name called and wound up returning to his home state. "People feel bad for me, but they shouldn't," Brewster said after he wasn't one of the five centers drafted. "My whole life I've had a chip on my shoulder and my record speaks for itself. I find a way to make things work and I'd rather be in Jacksonville in Florida than be a second-round pick somewhere I wouldn't be happy. Time to get to work and help the Jags win more games." It was an unusual draft for Bill Belichick and the Patriots. They traded up twice in the first round after years of dealing down and they didn’t make a trade with the Eagles. Things got back to normal later in the process, though, as the Pats dealt down to stock up on more picks and then took a flier on a player with an unusual background. In the sixth round they took Ohio State safety Nate Ebner, a walk-on who played all of three plays from scrimmage in his college football career. Ebner played a lot of special teams, but his real athletic interest was rugby. Ebner starred on teams in high school and harbored notions of a career as a professional rugby player before deciding to try his hand at football. He ran well at the Buckeyes Pro Day and caught Belichick’s eye. That connection is former Patriot Mike Vrabel, who was an assistant coach at his alma mater last season. His recommendation helped Ebner land in New England as one of the unlikeliest picks in this or any draft. As mentioned up top, there’s a precedent for this in New England. They’ve drafted special teamers like Matthew Slater in the past and this isn’t their first time taking a chance on an athlete from another sport. Stephen Neal was a wrestler in college, but the Patriots gave him a shot as an undrafted free agent in 2001 anyway. He got cut, went to the Eagles for a spell and then returned to the Patriots in time to pick up three Super Bowl rings while starting 81 games at guard over 10 seasons. COLUMBUS, Ohio -- Four Ohio State players should be taken in the NFL Draft this week. There's a chance the former rugby player who doesn't really watch the draft could get picked, too. 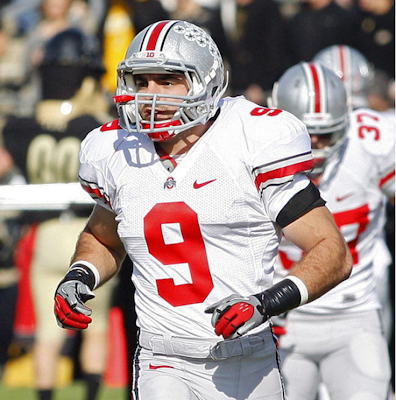 Nate Ebner is listed as a safety but played just a handful of defensive snaps as a Buckeye. But after opening eyes at the school's pro day in March, Ohio State's best special teams player from a year ago is completely focused on taking a shot at the NFL and making an international rugby career just a backup plan. "I'm giving football my 100 percent," Ebner said Tuesday. "I don't want to say, 'If I wasn't messing around with rugby, what would have happened?' It's football all the way, and if that doesn't work out, I'm definitely playing rugby somewhere if I'm not playing football. "But I'm going to be hitting people with my body as long as it can take it. And rugby's too fun to not play if I'm not playing football." After walking on with the Buckeyes in 2009, Ebner talking about the NFL might seem odd. But if you're on the field in an OSU uniform, you'll always get a look from the league. At least four Buckeyes have been drafted in five of the last six years, every draft but in 2008. A year ago, five Buckeyes were selected, led by defensive lineman Cameron Heyward going to the Pittsburgh Steelers in the first round. This year, offensive tackle Mike Adams should go in the first or second round, with center Mike Brewster, receiver DeVier Posey and running back Dan Herron projected as mid-round picks. National Football Post draft analyst Wes Bunting called it a "coin flip" between Brewster and Posey to see who is the next Buckeye off the board after Adams. "I think they're all in the fourth-fifth round range, maybe even sixth," CBSSports.com draft analyst Dane Brugler said of Brewster, Posey and Herron. In the Buckeyes' 6-7 season a year ago under interim coach Luke Fickell, with the loss of quarterback Terrelle Pryor hamstringing the offense and the repeated suspensions and constant talk of NCAA sanctions hovering over the program, it was difficult for any Buckeye to perform at his best. As OSU junior center Corey Linsley explained this spring, the team last season "didn't have a concrete foundation." Adams, Herron and Posey all were wrapped up in the program's tattoo scandal, with Adams suspended for five games, Herron for six and Posey for 10. They all lost chances to prove themselves on the field. Brewster wasn't involved, but didn't have the senior season he hoped for. "I think Brewster is more of a fourth-round guy," Brugler said. "He doesn't have a Pro Bowl quality to him, but he has the skills to be a potential starter. He didn't have quite the senior season that most expected, but I think he's very solid all around." Linebacker Andrew Sweat and right tackle J.B. Shugarts are two more Buckeyes who could be late-round picks or free agents in a camp. 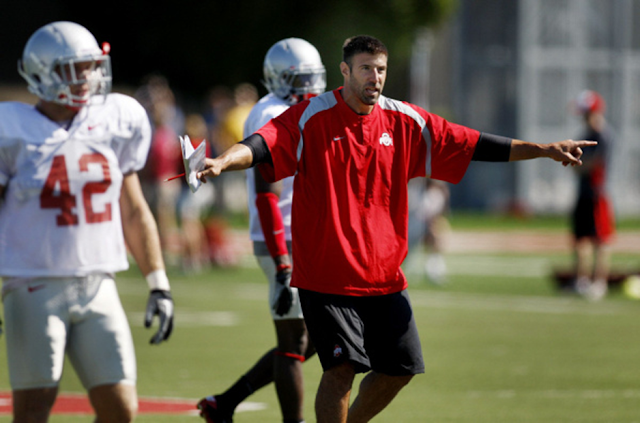 They, along with Adams, Brewster, Posey and Pryor, were part of Ohio State's heralded 2008 recruiting class, which most thought would be making a bigger draft impact four years later. Ebner wasn't a recruit at all. But if there's anyone who helped their NFL prospects with the 2011 Buckeyes, it may be Ebner. For a guy who didn't play high school football, now contemplating making a living at the game is a bit surreal. Except Ebner, who competed at an elite level in rugby, couldn't help but believe he'd have a shot. "Did I think I'd be in a position to get drafted?" Ebner said. "No way. But to possibly play on a pro team? I'd like to say that was always maybe the goal, but I didn't know how realistic it was until this past year." Ebner was timed as fast as a 4.48 in the 40 at the pro day, showed his agility with a fast time in the three-cone drill and did well in the broad and vertical jumps. He figured he might do well at the tests, and what he proved is that at about 215 pounds, he could be a raw athlete with a lot of room for growth. That should make him worth a look as an across-the-board special teams player, either in the draft or in free agency. He has continued to talk with NFL teams since pro day. "I'm not getting overly excited about the draft," Ebner said. "I just want a chance with a team. At the end of the day, you have to show up when it comes time to play." Then you get your body out there and start hitting people. Ohio State should have at least four players drafted this week and a few more have a shot. • OT Mike Adams (first or second round): First-round talent, but could slip to the second with off-field questions. • C Mike Brewster (third to sixth): Solid if not spectacular, viewed as about the fourth-best center in the draft, with Wisconsin’s Peter Konz and Michigan’s David Molk among those ahead of him. • WR DeVier Posey (third to sixth): Decent speed but didn’t always play that fast, now in the middle of the pack as about the 20th-best receiver, but not a bad bet to improve as a pro. • RB Dan Herron (fifth to seventh): Not great size or great speed, but runs hard and learned to hit holes, viewed as a potential second back in a two-back system. • S Nate Ebner (seventh or free agent): Would have to make his mark as a go-to guy on special teams, but he filled that role well at Ohio State. • LB Andrew Sweat (seventh or free agent): Battled injuries as a senior, a solid player but will have to make an impact on special teams. After five seasons in Indianapolis, Anthony Gonzalez will get to experience the other side of the Pats-Colts rivalry. FOXBOROUGH, Mass. 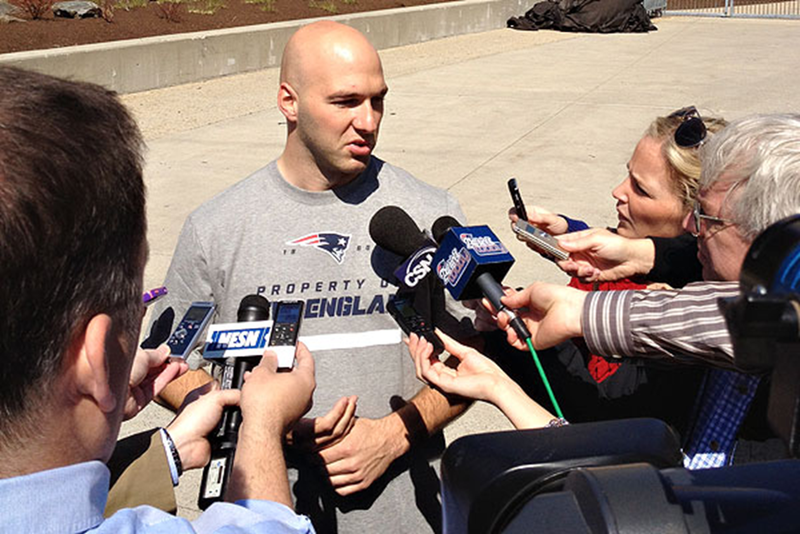 -- Speaking to reporters at Gillette Stadium on Tuesday, wide receiver Anthony Gonzalez said the Patriots were a team he had eyed as a potential landing spot this offseason, but that he was surprised to receive interest from New England early in free agency. "This is my first time as a free agent, I didn't know what was going to happen, I didn't know how it worked," Gonzalez said. "The phone call early was great, and somewhat surprising, but it was the one I was hoping to get, to be honest, when I evaluated free agency and different teams and how I thought I would fit culturally, and also from an offense standpoint, this was one that I had targeted. To have the interest be mutual, that worked out well." After five seasons in Indianapolis, Gonzalez, who signed with the Patriots on March 17, will get a chance to experience the Patriots-Colts rivalry from a different perspective. "I'm excited to be here. It's probably the best professional football environment that there is," he said. "Just being in the NFL and being on the other side of that rivalry for a while, there's not like a hatred or anything, it's more of a respect. As you learn more about the teams you are playing, especially this one, you kind of get an appreciation for how they do things, and just the way it's run, and that sort of thing. To me it was the perfect fit in a lot of ways." Gonzalez joked that he has a "strict hall of famer-only policy," now having a chance to catch passes from Patriots quarterback Tom Brady after four seasons with former Colts quarterback Peyton Manning. Gonzalez said he has yet to speak to Brady, but noted that he has worked closely with backup quarterback Brian Hoyer since arriving for offseason workouts early last week. Hoyer and Gonzalez were teammates at St. Ignatius High School in Cleveland, Ohio. "It's very odd," Gonzalez said of the chance to play again with Hoyer. "When you leave high school, you certainly don't expect to reacquaint yourself with your high school quarterback in the [NFL]. It's nice to kind of have a familiar face, somebody that you've known a while. I've known his wife longer than him, she was my sister's best friend. So there's definitely a familiarity there that is nice and comfortable." Gonzalez and wide receiver Matthew Slater spoke to reporters on Tuesday, while Hoyer, offensive linemen Ryan Wendell and Kyle Hix, and safety Josh Barrett were working out on the Gillette Stadium game field. The team's offseason program doesn't begin until Monday, but Gonzalez said it was important to him to get an early start. "I just wanted to get up here. I want to get immersed as quickly as possible. It's a lot easier to get to know people when it's small groups," Gonzalez said. "I'm kind of sneaking around trying to learn as much as I can. There's kind of goofy rules right now, as to what you can and can't do. "My focus, whether it's with Tom or Brian or with anybody, is just to learn this offense as quickly as humanly possible," Gonzalez continued. "I know just from watching that it's a pretty complex, pretty involved offense, and the one in Indy was too, so that part doesn't worry me, but I do want to make sure that when it's time to get out on the field and go through things, that there's no hesitancy mentally, because if I don't know exactly what I'm doing, there's going to be problems." The former first-round pick in 2007 has been one of the NFL's most injury-plagued players over recent seasons, but told reporters on Tuesday that he preferred to keep his focus on his future, not his past. "I don't go home and think to myself 'oh my gosh, I've been hurt all these times, how am I going to do whatever,'" Gonzalez said. "My focus has always been and will continue to be what am I doing today, what I am I doing tomorrow, what am I doing next week, and you just kind of deal with things as they come up." 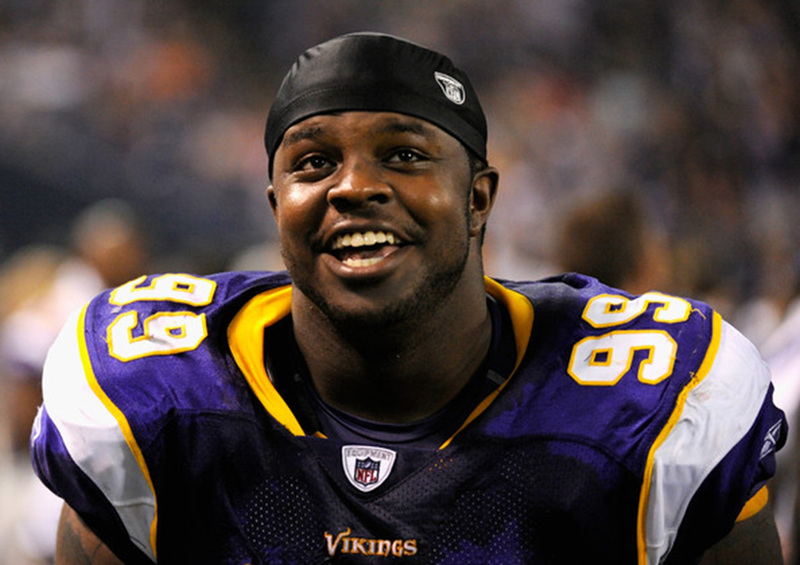 Vikings DT Christian Ballard will join the world famous Harlem Globetrotters in a comical football routine at the Target Center during the third quarter of the game on Friday, April 6 at 7:00 p.m CT. In celebration of Ballard’s guest appearance, the Globetrotters are collaborating with the Vikings to donate tickets for Friday’s game to youth from The Zanewood Recreation Center of Brooklyn Park. Ballard will join a long list of NFL stars to participate in “Globetrotter Football” including, Ben Roethlisberger, Ray Rice, Brandon Jacobs, Jay Cutler, Lance Briggs, and many others. The Globetrotters cater their famous football skit to the skills of the NFL player. The Globetrotters bring two games to the Target Center on Friday, April 6 at 7 p.m. and Saturday, April 7 at 2 p.m. Tickets are available at www.harlemglobetrotters.com and the Target Center Box Office. The Globetrotters will play over 270 games on the North American portion of the 2012 World Tour, bringing the Globetrotter magic to over 230 cities in 46 states, the District of Columbia, and five Canadian provinces. Sponsored by Howard Johnson Hotels, Greyhound Lines, Spalding, and Russell Athletic, the Original Harlem Globetrotters will celebrate their 86th consecutive year in 2012, continuing a world famous tradition of ball handling wizardry, basketball artistry and one-of-a-kind family entertainment that continues to thrill fans of all ages. Throughout their history, the Globetrotters have showcased their iconic talents in 120 countries and territories on six continents, often breaking down cultural and societal barriers while providing fans with their first-ever basketball experience. Proud inductees of the Naismith Memorial Basketball Hall of Fame, the Globetrotters have entertained hundreds of millions of fans—among them popes, kings, queens, and presidents—over more than eight thrilling decades. For the latest news and information about the Harlem Globetrotters, and to purchase tickets and team merchandise, visit the Globetrotters’ official Web site: www.harlemglobetrotters.com. Best: Ray Lewis (1996) – Heavy competition here between numerous Pro Bowl stars, but no one ranks ahead of the iconic linebacker. Worst: Kyle Boller (2003) – He was supposed to be the answer under center but was never more than a question mark. His failure eventually got Brian Billick fired. Best: Ray Rice (2008) – He has made the Pro Bowl twice in four years and led the league in yards from scrimmage in 2011. It’s hard to believe the Ravens’ offensive centerpiece was not a first round pick. 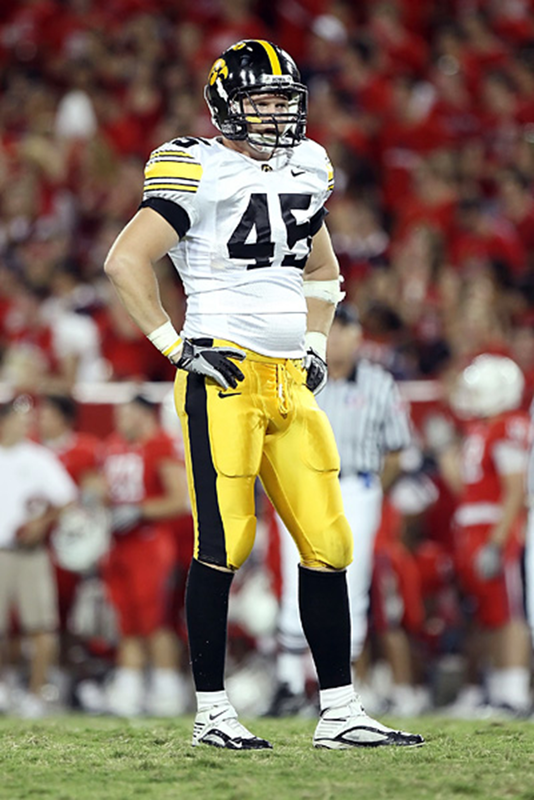 Worst: Dan Cody (2005) – Trumpeted as a high-motor sackmaster-in-waiting, he suffered a serious knee injury on the first day of training camp and never really came all the way back. 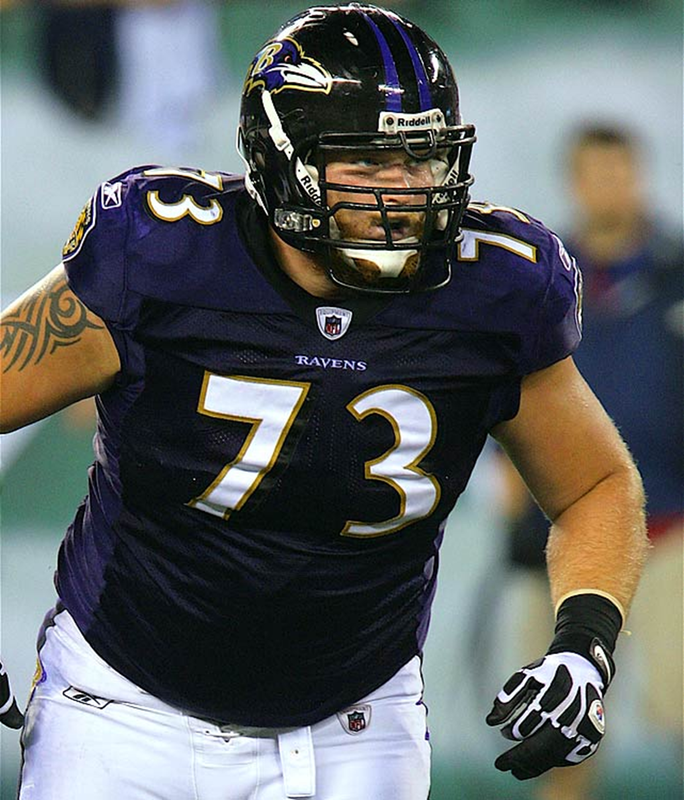 Best: Marshal Yanda (2007) – The Ravens love to take rugged linemen in the middle rounds and developed them into starters. Yanda is a classic. He made the Pro Bowl in 2011. Worst: David Pittman (2006) – The Ravens reached for a small-college player (Northwestern State) and got their hands slapped. Pittman made one start in two seasons, grabbed a cup of coffee with a pair of other teams and now plays for the Edmonton Eskmos. Best: Brandon Stokley (1999) and Jarret Johnson (2003) – Ozzie Newsome satisfied his Bama fix with Johnson, a rugged linebacker who became a cornerstone, starting a franchise-record 80 straight games. Stokley caught the Ravens’ first touchdown in the Super Bowl and played 13 years in the league. Worst: P.J. Daniels (2006) – A running back from Georgia Tech, Bounced around the fringes of the roster for three years, suffered an injury, never gained a yard for the team. Best: Dawan Landry (2006) – Despite being picked so low, he was a starter virtually from the moment he joined the team, and played alongside Ed Reed through 2010 before departing as a free agent. Worst: Ryan Sutter (1998) – The former Colorado safety was cut in training camp, got hurt on his first play with another team (Carolina) and never had a career. But he did win the first “Bachelor” reality show contest. His wedding was on TV. Worst: Tie between numerous players who didn’t make the team, such as Josh Harris (2004), a quarterback from Bowling Green who later sat on the bench in Cleveland for two years, wound up in indoor ball and recently came out of retirement ro play for the Marion (Ind.) Blue Racers. Best: Cam Quayle (1998) – Slim pickings here. He never played for the Ravens but, as the last player taken in the draft, was given the Mr. Irrelevant treatment, invited to California for a week of fun. He broke up with his fiancé during the week. Worst: Tie between numerous other players who didn’t make the team, such as defensive end Dwayne Missouri (2001), who was cut off the practice squad and later played for the Colorado Crush, Philadelphia Soul and Utah Blaze. From Brandon Castel's "Two-Minute Drill: Updates from Coach Meyer’s Spring Kick-Off"
COLUMBUS, Ohio — Ohio State head coach Urban Meyer headlined the school’s spring kick-off event Tuesday, which also doubled as a fund raiser benefiting the Earle & Jean Bruce Alzheimer’s Research Fund. Meyer was introduced by his mentor, Earle Bruce, and provided the crowd of nearly 1,000 people at the Woody Hayes Athletic Center with a brief look into the first week of spring practice for the Buckeyes. One fan bid $3,000 for he and 5 friends to have dinner with Luke Fickell and Mike Vrabel. Fickell joked that they were paying $2,700 for him and $300 for Vrabel, and that Vrabel had to get the check. Meyer said if Vrabel isn't the best recruiter on the staff, he's one of them. Has already proved himself in that area. They also auctioned off the first two photos with Bruce, John Cooper, Jim Tressel and Urban Meyer posing together. One photo had them outside Ohio Stadium, and the other had them doing O-H-I-O inside the Horseshoe.